Fungi are microscopic cells that usually grow as long threads or strands called hyphae, which force their way between particles of soil, rocks and roots. They are closely related to animals and plants, and have been around for an estimated billion or so years. Humans share about 80 percent of their genes with fungi, meaning that your neighbor and your garden fungus may have more in common than meets the eye. At least 70,000 distinct species of soil fungi have been identified worldwide. These can be divided taxonomically into four groups: Zygomycota, Ascomycota, Basidiomycota, and Deuteromycota. It is perhaps easier, however, for everyday observers to think of them in terms of their function and metabolic properties. Saprophytic fungi are decomposers. Fungal saprophytes decompose cellulose and lignin found in soil for energy. The metabolic byproducts of this process include carbon dioxide, or CO2, and small molecules such as organic acids; some of these metabolites can remain in the surrounding soil for thousands of years under the right conditions. Saprophytic mushrooms can grow in a wide variety of locations because of the widespread nature of the substances from which they derive nourishment. Some saprophytic fungi are called "sugar fungi" because they use the same substrates as do many bacteria. Mutualistic fungi are also called mycorrhizal fungi. These soil fungi colonize plant roots and are termed "mutualistic" because the fungi derive a benefit from the presence of the plants and vice versa. In exchange for carbon atoms from the plant, mycorrhizal fungi help make phosphorus easier for the plants to draw in, and they also bring other soil nutrients, including nitrogen, micronutrients and water to the plants on which they are anchored. Mutualistic fungi include two major groups. One of these is the ectomycorrhizae, which grow on the surface of plant roots and are frequently seen on or near trees. The second major group, the endomycorrhizae, grow within, rather than on, the plant root cells, and are usually associated with grasses, crops grown in rows, vegetables and everyday shrubs. Also called parasitic fungi, these fungi, in stark contrast to the mutualists, result in reduced plant production or even the death of plants when they colonize roots or other soil organisms. Root-pathogenic fungi cause major annual economic losses in human agricultural endeavors. 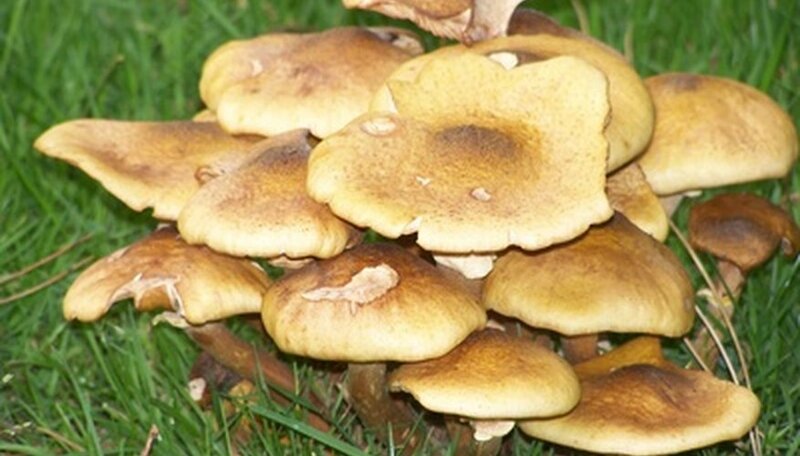 Many of these fungi, however, can help control diseases when properly deployed. For example, nematode-trapping fungi parasitize disease-causing nematodes, or roundworms, while fungi that derive their energy from insects may be put to use as pest-control agents. What Two Roles Do Lichens Play in an Ecosystem? Beck, Kevin. "Common Types of Fungi Found in Soil." Sciencing, https://sciencing.com/common-types-fungi-found-soil-6365925.html. 30 July 2018.